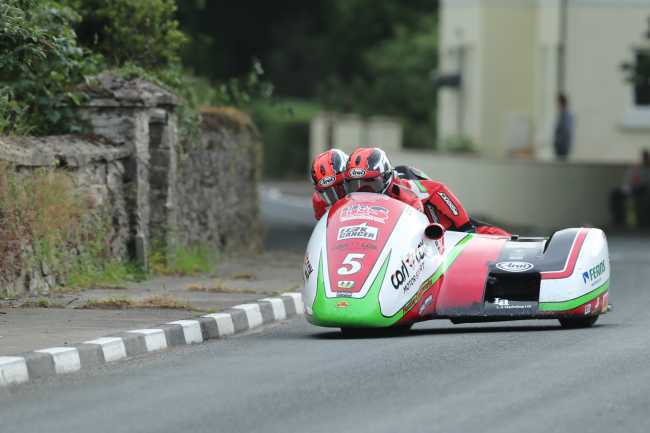 Ben and Tom Birchall took their seventh Isle of Man win on Saturday evening when they blitzed the record books in the opening Locate.im Formula Two Sidecar race at the 2018 Isle of Man TT Races fuelled by Monster Energy, shattering both lap and race records. The Mansfield brothers broke their own lap record on each of the three laps, moving the outright lap record to an astonishing 118.694mph, and they came home 47.1s clear of John Holden/Lee Cain with Tim Reeves/Mark Wilkes completing the podium in third. The Birchalls led from start to finish and at Glen Helen on the opening lap, their advantage over Holden/Cain was a slender 2.1s with Reeves/Wilkes only a further second back as Alan Founds/Jake Lowther, Pete Founds/Jevan Walmsley and Dave Molyneux/Dan Sayle completed the top six. As the lap progressed, the Birchalls continued to extend their lead through all the timing points and it was clear they were on a fast lap – indeed, as they flashed across the line at the end of the lap, they broke their own lap record with a speed of 117.502mph. That gave them a more than healthy lead of 13.1s over Holden/Cain and although Reeves/Wilkes continued to hold onto third, there were problems for Founds/Lowther who pitted to make adjustments and Molyneux/Sayle who retired from the race whilst holding onto sixth. Meanwhile, newcomers Michael Jackson/Harry Payne set a good opening lap of 106.242mph. The pit stop dropped Founds to 21st place but there were no such problems at the head of the field and the Birchalls were setting a sensational pace and by the end of the lap, they’d doubled their lead to 26.1s – and little wonder as they’d smashed the lap record with a stunning lap of 118.694mph. Holden/Cain became only the second crew to lap at more than 117mph with a lap of 117.370mph and they were now 19 seconds clear of Reeves/Wilkes. Founds/Walmsley were up to fourth with a new personal best lap of 114.613mph ahead of Conrad Harrison/Andy Winkle and Founds/Lowther who had amazingly climbed all the way back up to sixth. 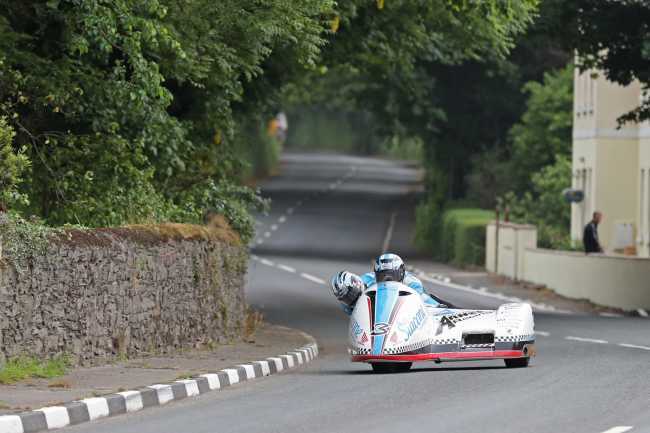 On the third and final lap, the gaps between the front runners continued to widen and with a final lap of 117.771mph, the Birchalls came home for their seventh TT win and fourth in a row. Holden’s runner-up spot was his ninth podium in a row and 19th in total, while passenger Lee Cain became the fastest Manx passenger whileReeves/Wilkes came home in a good third place. Founds/Walmsley took fourth place with brother Alan and passenger Lowther taking a brilliant fifth place given their earlier pit stop and it was Harrison/Winkle who completed the top six. Darren Hope/Lenny Bumfrey, Gary and Daryl Gibson, Gary Bryan/Phil Hyde and Greg Lambert/Julie Canipa rounded out the top ten. Quarry Bends during the LOCATE.IM Sidecar TT race one.